I’m calling you out on your favorite excuses for not exercising. You have no motivation: Read the above 15 reasons to exercise and find which one motivates you. Do you want to look better? Do you need to fight disease or aches and pains? Find your motivation and run with it. You don’t know where to begin: No problem. I do know where you should begin. Call or email me today and together we will get your workouts back on track. Embrace your motivation, and get started. It’s normal to have days where you just don’t feel like exercising. You feel too busy, too stressed and quite simply too tired. And you forget about all the amazing benefits that a consistent and challenging exercise routine gives you. I’m here to remind you. Here’s a list of 15 of the top reasons to exercise. Pull out this list and read it when you’re having one of those days. Regular exercise gives you so many amazing benefits, as you’ve been reminded from the above list. Place the orange juice and orange zest in a large ziplock bag. Season each side of the chicken breasts with salt and pepper. Place the chicken breasts in the ziplock bag, coating each side with juice. Marinate in the refrigerator for 2-3 hours. Grease a 12-inch, oven-proof skillet with the olive oil. Place over medium-high heat. Add the chicken breasts in a single layer, cooking for 3 minutes. Turn the chicken, season with a sprinkle of salt and pepper. Place the skillet in the oven for 15 minutes, or until a thermometer registers 165 degrees F in the center of the thickest breast. Remove from oven and cover with foil as you make the sauce and cook the beans. Wash the beans, snap off and discard the stems. Place in a large ziplock bag with the orange juice and orange zest. 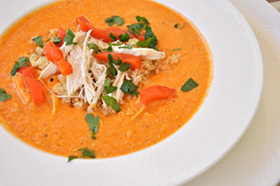 Allow to marinate in the refrigerator for 30 minutes. Heat a medium sized skillet over medium heat. Grease with the olive oil. Remove beans from refrigerator, discarding the juice. Add to the skillet and cook, covered for about 5 minutes, stirring occasionally. Remove cover, increase the heat and cook for an additional 3 minutes, until the beans are bright green. In a medium skillet heat the coconut oil over medium-high heat. Add the minced shallot, cook, stirring often, for 2 minutes. Turn off the heat, add the brandy. Return to the heat and cook, scraping the bottom, until the brandy has almost evaporated, about 30 seconds. Increase the heat to high, add the orange juice. Boil for 5 minutes. Add the chicken broth, boil for 3 minutes. Add in the orange segments and the parsley. Turn off heat. Season with salt and pepper. 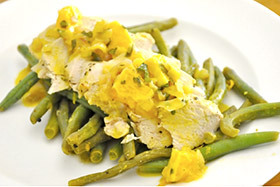 Cut the chicken on the diagonal into thin slices and arrange over a pile of green beans. Drizzle with the orange-brandy sauce. Catfish is a wonderful source of low fat protein. Lots of recipes call for frying catfish, but baking turns it into a low calorie, high protein meal. 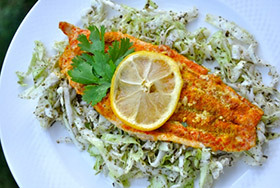 The generous seasoning of the catfish lends to a rich flavor that is complimented perfectly by the light minty salad. How effective is your exercise time? It’s my passion to make exercise a regular and enjoyable part of your life. I’d like to see you enjoy all of the healthy rewards of being fit.